The editorial board of PSRI is pleased to announce to all of its readers, authors and scientific reviewers the formal inclusion of this journal in the prestigious international database SCOPUS, currently considered as “the largest abstract and citation database of peer-reviewed literature: scientific journals, books and conference proceedings”, which includes the indicators of the impact factor (SCR/SJR) (Scimago Journal Rank) and SNIP (Source-normalized impact Paper). We wish to thank all collaborators for their support in the achievement of this major accomplishment for PSRI. Pedagogía Social. Revista interuniversitaria, PSRI (Journal of Research in Social Pedagogy) is a regular biannual scientific journal, continuously edited since 1986 by Asociación Iberoamericana de Pedagogía Social. Its main aim is to display original research findings about Social Pedagogy and Social Education performed at national and international level, being a medium of expression to facilitate access to quality and accredited scientific papers intended for professionals, teachers at different levels and researchers interested in the aspects of social and educational context. PSRI is a bilingual publication (Spanish or Portuguese and English) whose works are assessed by external experts (peer review process and double-blind system). Since 2012 the magazine is exclusively published in digital format (e-1989-9742) and holds since 2010 the Editorial and Scientific Quality Seal of Spanish Scientific Magazines given by FECYT. Indexing, among others in SCOPUS, ERIH PLUS, In-RECS, FRANCIS, ERIH, DOAJ, our journal also belongs since 2015 to the Web of Science Core Collection, inside its new database ESCI (Emerging Sources Citation Index). Pedagogia Social. 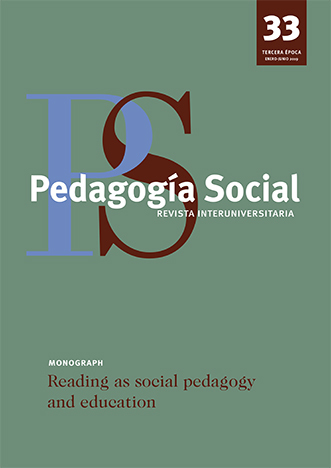 Revista Interuniversitaria addresses emerging issues in the field of social pedagogy and social education (in and out of school), social work and social services. Topics covered include: cultural, socio-cultural, community development, political and socio-educational programs, maladjustment, social integration and exclusion, leisure, social and school violence, adult, elderly, gender, training and professionalization.